The recent dismissal of the Georgetown University 403b excessive fees/breach of fiduciary action has led some to suggest that such actions are now over. A closer look at the Georgetown decision suggests that that opinion may be premature. I always read every decision in 401(k)/403(b) excessive fees/breach of fiduciary actions. As I read Judge Collyer’s decision, I understood and agreed with her Honor’s reasoning…until I came to her analysis of the CREF Stock fund (Stock fund). As I read the Court’s analysis of the Stock fund, one statement in particular immediately caught my attention. Notably, the independent analyst Morningstar rated the CREF Stock Account as a 5-start (sic) investment option, which also counters plaintiffs’ allegations of imprudence. With all due respect to the Court and her Honor, I do not, and cannot, agree with that conclusion. Based on the nature of the arguments within the Court’s analysis of the Stock fund, the Court based its opinion purely on the fund’s returns, both the fund’s nominal, or stated, and risk-adjusted returns. In fairness to the Court, it appears that the Court’s analysis was based on two benchmarks designated by the Stock fund, two market indices, not on the Vanguard fund. Comment h(2) is particularly interesting. Numerous studies have shown that the overwhelming majority of actively managed funds are not cost-efficient.5 In fact, one study concluded that the majority of actively managed mutual funds fail to even cover their costs.6 Since most 401(k) and 403(b) plans still primarily choose actively managed mutual funds, these studies should be strongly considered by plan sponsors and other plan fiduciaries, such as a plan’s investment committee. This is even more noteworthy since most plan advisory contracts include language insulating the plan service provider from any liability in connection with the advice provided to the plan. So the Restatement establishes cost-efficiency as a factor in evaluating the prudence of a plan sponsor or any other plan fiduciary. Yet, for some reason, you rarely see cost-efficiency plead in ERISA plaintiffs’ complaints or addressed by the courts in dismissing 401(k) and 403(b) breach of fiduciary actions. Recognizing the Restatement’s standards regarding the importance of cost-efficiency in potential breach of fiduciary duty cases. I created a simple metric, the Active Management Value Ratio™ 3.0 (AMVR). The AMVR is a simple, straightforward metric that allows investors, plan sponsors, investment fiduciaries and attorneys to determine the cost-efficiency of actively managed mutual funds, or simply two mutual funds. The metric is free and only requires the ability to perform the basic My Dear Aunt Sally (multiplication, division, addition, subtraction) math skills we all learned in elementary school. I do not know what the actual data was that was presented to and used by the Court in deciding the Georgetown action. As I mentioned earlier, I am relying on information that I obtained from the Morningstar and Financial Times web sites. The data is based on the recent five-year performance of both funds as of December 31, 2018. 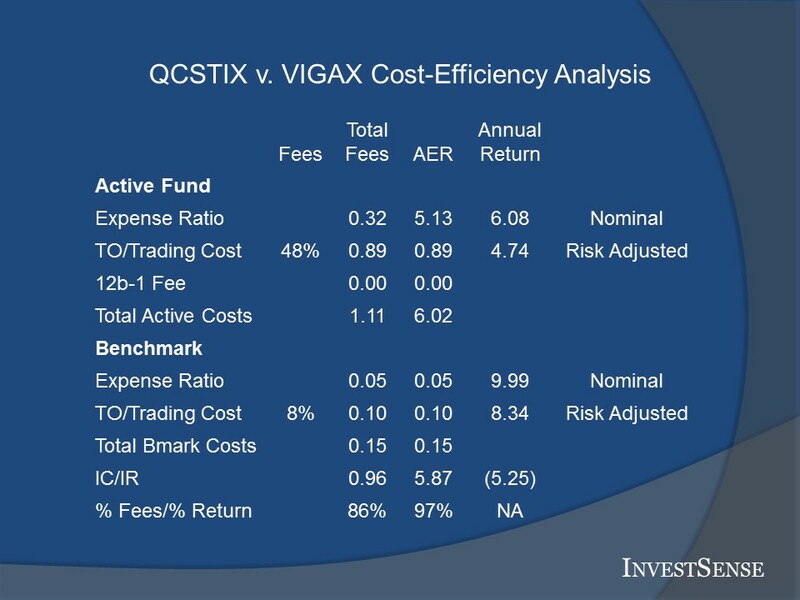 As I mentioned earlier, a chart from the Financial Times web site comparing the Stock fund (QCSTIX) to the Vanguard Growth fund (VIGAX) clearly shows that the Vanguard fund has consistently outperformed the Stock fund since the Stock fund’s inception. The AMVR cost-efficiency analysis further supports the argument that the Vanguard fund is a more prudent investment option for fiduciaries. The first step in an AMVR analysis is to determine whether the actively managed fund, or simply the fund being considered, managed to produce a positive incremental return relative to a comparable index fund. Here, the Stock fund has not only underperformed the Vanguard fund, but by a large margin, 525 basis points. That alone establishes that the Stock fund is an imprudent selection by a fiduciary. Since actual trading costs are difficult to obtain, the AMVR uses a metric created by John Bogle. While Bogle’s metric probably understates a fund’s actual trading costs, it provides a proxy for such costs. Since a fund’s trading costs are often larger than a fund’s annual expense ratio, such costs potentially have too much of an impact on a fund’s cost-efficiency and overall performance to simply be ignored. The AMVR calculates a fund’s cost-efficiency rating on both a fund’s reported costs and a fund’s R-squared rating. The R-squared metric measures the extent to which a fund tracks a comparable market index or a comparable index fund. The R-squared metric helps to detect a “closet index” or “index hugger” fund. Closet index funds are actively managed funds that essentially provide the same performance of a comparable index fund, but charge a much higher fee. They are cost-inefficient, and thus imprudent investment choices, by their very nature. In this case, the reported costs are 96 basis points higher than the index fund’s fees. As a result, the Stock fund’s incremental, or extra, costs constitute 86 percent of the Stock fund’s total costs, while providing no incremental return, or benefit, to an investor at all. The AMVR uses the Active Expense Ratio (AER) to calculate a fund’s effective annual expense ratio. The AER was created by Professor Ross M. Miller. The AER uses a fund’s R-squared number, or correlation of returns, to calculate the effective annual expense ratio that investors in the fund pay. The higher a fund’s incremental costs and/or R-squared number, the higher the fund’s AER. Professor Miller found that investors often pay effective expense ratios that are 6-7 higher than the fund’s stated expense ratio. In this case, the Stock fund had an R-squared number of 97, suggesting an extremely high correlation of returns between the Stock fund and the Admiral shares of Vanguard Growth Index fund. The high R-squared number, combined with the Stock fund’s high incremental costs, resulted in an effective annual expense ratio of 5.13. Substituting the fund’s AER for the lower stated expense ratio resulted in the fund’s costs constituting 97 percent of the fund’s total cost, again with no incremental return, or benefit. It would be hard to legitimately argue that the Stock fund is prudent in either scenario. This is supported by the comparison chart available on the Financial Times site. The comparison chart essentially confirms that the Stock fund is a “closet index” fund, with virtual identical returns of the Vanguard fund, lowered by the Sock fund’s higher fees/costs. So, is it reasonable to predict that the Georgetown decision and other similar 403(b) dismissal decisions are indications that 403(b) breach of fiduciary actions will decline? No one knows for sure, but if plaintiffs’ ERISA attorneys tweak their complaints to include claims based on cost-efficiency and “closet index” issues, I see no reason for such actions to decline. Judges are only allowed to determine questions of law. Questions of fact are the exclusive province of the jury. Questions involving cost-efficiency and/or “closet indexing” are clearly questions of fact. As a result, incorporating those two issues in an action could reduce the number of early dismissals. Funds that are not cost-efficient means that investors in such funds effectively suffer a net loss on their investments. The AMVR not only identifies funds that are not cost-efficient, but helps define the damages resulting from a fund’s lack of cost-efficiency. Most funds focus on returns, specifically nominal, or stated, returns. Funds try to avoid discussing load-adjusted and risk-adjusted returns since they usually reduce an actively managed fund’s return, thereby favoring index funds. Most funds and stockbrokers want to avoid any discussion of the cost-efficiency of actively managed mutual funds, as funds know that they usually will lose that argument due to the high fees commonly associated with such funds. Most funds and stockbrokers also want to avoid any discussion of “closet indexing,” as many actively funds have made a conscious decision to closely track the performance of comparable indices and index funds in order to avoid significant variances in performance, which could result in customers leaving in favor of comparable, but less expensive, index funds. On the other hand, those are precisely the reasons plaintiff’s ERISA attorneys may choose to tweak their pleadings to include claims relative to cost-efficiency and “closet indexing.” As mentioned earlier, focusing on those two issues would create questions of fact, which judges are not allowed to decide. As a result, arguments based on cost-efficiency and “closet indexing could effectively reduce the number of pre-trial dismissals of 403(b) breach of fiduciary duty actions. If you know the enemy and you know yourself, you need not fear the result of a hundred battles…. He who is prudent and lies in wait for an enemy, who is not, will be victorious. The evidence overwhelmingly supports the argument that most current actively managed funds are not cost-efficient. Could they become cost-efficient and reduce fiduciaries’ liability exposure? Absolutely. Are they likely to reduce their costs in order to become cost-efficient? Not likely. But that’s just my opinion. Until then, prudent plan sponsors and investment fiduciaries will evaluate existing and potential plan investment options on both risk-adjusted returns and cost-efficiency, including potential “closet indexing” issues. Prudent plaintiff’s attorney will do likewise in order to reduce the odds of dismissal and maximizing their action’s potential damages. 2019 could turn out to a pivotal year in the future of ERISA litigation. Copyright © 2019 The Watkins Law Firm. All rights reserved. 1. Tibble v. Edison Int’l, 135 S. Ct 1823 (2015). 2. Restatement (Third) Trusts, Section 90, comment b. 3. Restatement (Third) Trusts, Section 90, comment f.
4. Restatement (Third) Trusts, Section 90, comment h(2). 6. Meyer-Brauns, Philipp, “Mutual Fund Performance Through a Five-Factor Lens,” Dimensional Funds Advisers, L.P., August 2016. 7. Carhart, supra; Malkiel, Burton, “A Random Walk Down Wall Street,” 11th Ed., (W.W. Norton & Co., 2016), 460. This entry was posted in 403b, closet index funds, consumer protection, cost consciousness, cost efficient, ERISA, ERISA litigation, fiduciary compliance, fiduciary law, Fiduciary prudence, fiduciary standard, investments, pension plans, prudence, wealth management, wealth preservation and tagged 403b, Active Management Value Ratio, AMVR, ERISA, fiduciary, fiduciary investing, fiduciary law, Fiduciary prudence, fiduciary standard, investment advisers, investment analysis tools, pension plans, prudence, wealth management, wealth preservation. Bookmark the permalink.